The keyboard shortcut very useful for iOS and Mac users, That increase is typing speed and energy saving option when you need to use the same phrase regularly. 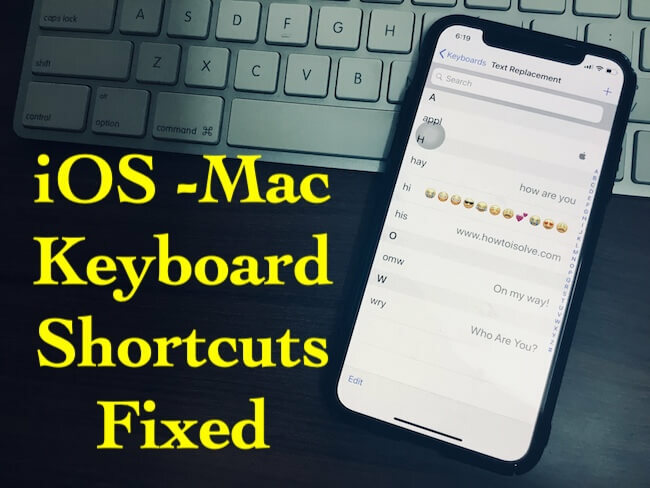 Today we will see how to fix Keyboard shortcuts not working after updating to iOS 12, Unable to use recently added Keyboard Shortcuts and Won’t replace the keyword with Keyboard Shortcuts. There are many reasons behind this dramatic issue like minor glitches with iOS version, malware attack and more. We don’t have to discuss the root of the problem, let’s directly fix the iOS 12 Keyboard Shortcuts not working in iPhone. There are few fixes mentioned try to use shortcuts after implementing the solution. Created Keyboard Shortcut you can use on your Other apple Device automatically, Like Mac, iPad, iPod Touch. While we write on Pages, Number, Notes and Mail, Contacts, Messages app. Most of the time I use my favorite Apple Symbols using Keyboard Shortcut, You can also create Keyboard Shortcuts Symbols. When we face any glitch in function and at that time the simple and quick solution is to disable and re-enable the function. Likewise, we will delete the shortcut and create again. Step #1: Go to “Settings” and open “General”. Step #2: Tap “Keyboards” and then tap “Text Replacement”. Step #3: A whole list of shortcuts will be visible, to delete the shortcut swipe from right to left and delete the shortcut. Double check and Verify that you are typing the correct shortcut. 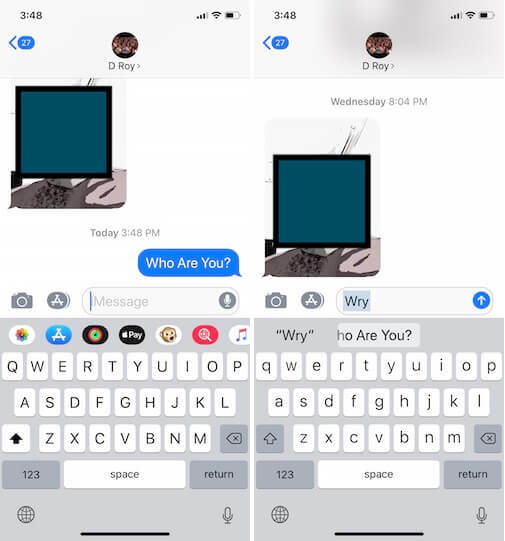 Step #2: Tap on “Keyboards” and their open “Text Replacement”. Step #3: Now, to add a new shortcut tap on (+). Keep typing from your keyboard in natural way. While you type Shortcut Keyword, Your Keyboard will recommend Full syntax or lines. it doesn’t matter predictive text in on or off. See the below screen. Another way is to add the keyboard shortcut with new keyword to the existing list. Step #2: Tap “General” and open “Keyboards”. Step #3: Next, tap on “Text Replacement” to add a new shortcut. Step #4: Lastly, type a phrase and allot shortcut and tap Save. If the above solutions didn’t fix keyboard shortcuts not working in iPhone then give a fresh start to your iPhone/iPad by hard rebooting. Step #3: Next, hold down the Sleep/wake button until you see the Apple logo on the screen. Step #1: Press and hold Volume Down key and Power key until the Apple logo appears on the screen. Step #1: Press and hold the Home button and Side button and release when the screen goes black. Unfortunately, if anything doesn’t work then you have to remove all the shortcuts and re-add them. Once you add them to restart the iPhone and check out if it is working or not. Clear the data from the iCloud to free up the bugs which are affecting the Keyboard shortcuts. Most of the MacBook users have a query on why my MacBook Pro, MacBook Air or iMac not suggest Keyboard Shortcuts as predictive text or line while they are typing on the document, Mail etc.. Turn off predictive text on iPhone, Reboot or Restart your iPhone using the above steps [Follow reboot guide from method 3]. Enable iCloud Drive, Go to the “Settings” > “Your Profile Name” > “iCloud” > “iCloud Drive [Enable iCloud Drive toggle]“. Sign Out iCloud: Go to the “Settings” > “Profile Name” > “Sign Out“. Step #1: Launch “Settings” from the home screen. Step #3: Tap on “Reset Keyboard Dictionary”. This is silly but we can give one try to this. Disable the Emoji and check if the shortcuts are working or not. If this solution work for you then enable Emoji again. Above all are the quick fix and Troubleshooting problems of the basics issues while we use Keyboard Shortcuts on iOS device or Mac.